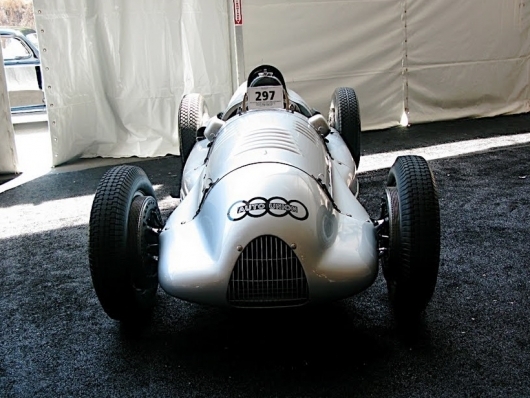 One of the highlights of Pebble Beach weekend – and in, in fact, one of the highlights in all of motorsports – are the Monterey Historic Automobile Races. In fact, it’s the reason that most people schlep through Ferrari-laden traffic jams on the Peninsula this time of year. Few events offer the opportunity to see classic competition-prepped race cars compete like the Rolex Monterey Historic Automobile Races. Started in 1974, the races bring cars and drivers from around the world to show off on the storied tarmac of Laguna Seca Raceway. It’s an amateur event, so anyone with a classic racer can join in with the likes of industry giants Vic Edelbrock, Jr., Timo Glock, Mario Andretti and Stirling Moss around the famed ‘Corkscrew’. Though the rules vary from race to race, one regulation reigns above all else. Since so many of the cars on the race track are rare or completely unique, anyone who causes damage to another vehicle is immediately pulled out of competition and banned from future events. Most races last about 10 laps and are broken up according to displacement and time period. That said, none of these cars would be mistaken for a demolition derby car. 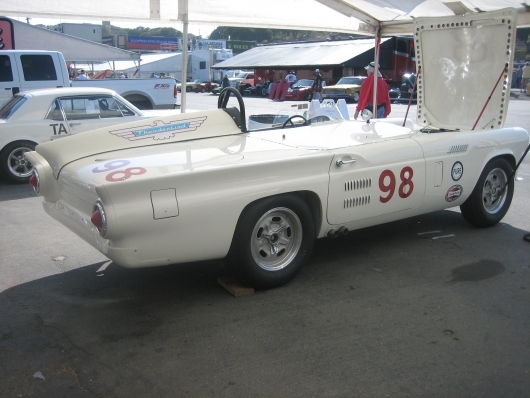 Most of the cars that race – a parade of vintage nameplates and models like Alfa, Bugatti, Maserati, Ford GT40 – are worth figures in the “I can buy a condo in Pomona for this' range. 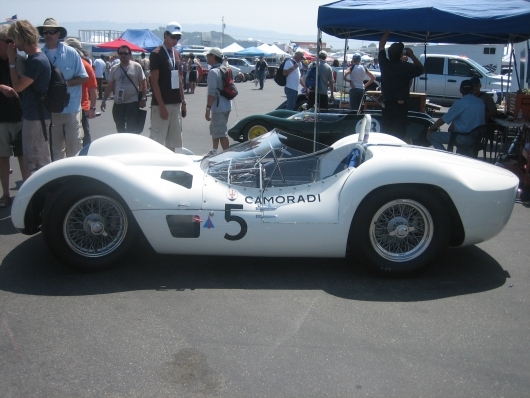 Our favorite race was Saturday’s Group 6A, which was 1955-1961 Sports Racing Cars over 2000cc, that featured not one, but not two but four – FOUR – Ferrari Testarossas, alongside two Devin SS models and a wonderful 1960 Maserati T-61 Birdcage. This year, Porsche was the featured manufacturer, and the German company had a number of historic racers on hand to celebrate including a 1962 Type 804. While Porsche has chalked up innumerable victories in nearly every form of motorsport out there, it only has a handful of F1 wins, and the Type 804 supplied those in the early-to-mid sixties. That car and others were on loan from the newly-finished Porsche museum in Germany. We've picked our five favorites of this year's Historic Races for your drooling pleasure! This is a 1957 Ford Thunderbird nicknamed “The Battlebirdâ€. Only two of these weird looking monstrosities were ever built, both for the 1957 Daytona Speedweek. This Battebird flew at over 200 mph at the event, but lives on in weirdness forever. Maserati MC12 Tipo 61 “Birdcageâ€, named after its complicated ‘birdcage’ tube chassis. Built from 1959-1961, these Maseratis did well at Le Mans. Shown in white and blue in the Camorati race team livery. 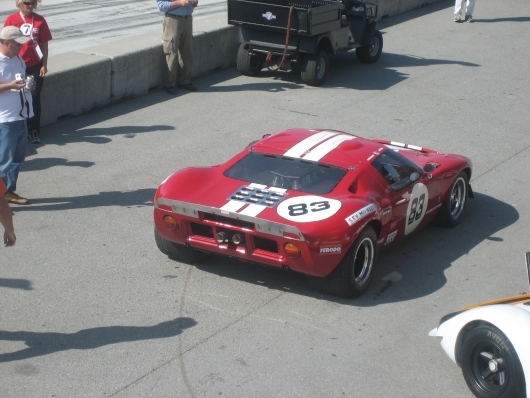 Again, this car was in the Group 6A category. 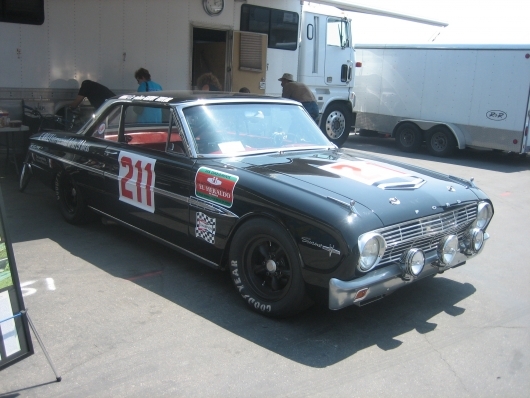 Jorge Arroyo piloted this 1963 Ford Falcon to finish the famous Mexican’ road race, La Carrera Panamericana in 2006. Which is dang cool for a Falcon of any age. 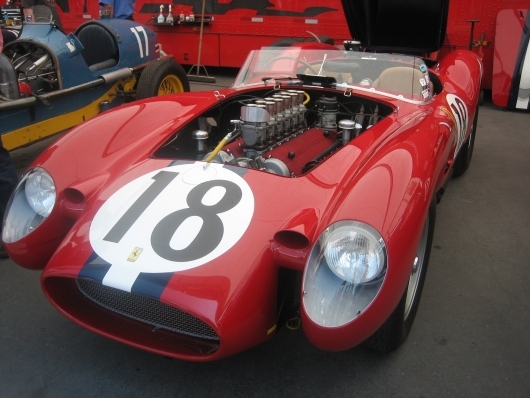 We love the sleek lines of the 1957 Ferrari 250 Testarossa V-12. This is one of 22 made, we estimate its worth at around $10-12 million. In this Group 6A running, there were not one, not two, not three, but four – FOUR – Ferrari Testarossas in the same event.